Topics: A-speakers, Speakers Blogs, References, Articles And Publications, and Speakers’ Videos. 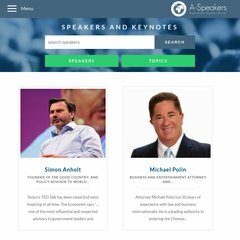 a-speakers.com Thomas Koulopoulos - speaker on management, leadership and on the ..
117 users visit the site each day, each viewing 2.20 pages. It has 2 DNS records, ns02.one.com, and ns01.one.com. One.com A S Copenhagen is the location of the LiteSpeed server. The site is programmed for PHP/5.3.17.